Although there is no automated way to toggle the visibility/invisibility of items for a certain group of users based on the item’s status, it is possible to do this through a manual process if you are an Organization Admin. You can set items, sets, folders or components to be hidden from a certain User Group by removing the Read and Create/Edit rights via Admin > Permissions. 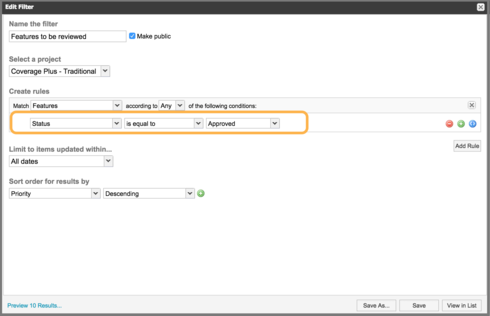 As soon as the items reach your specified stage of approval you can give permissions back to that User Group. The Organization Workflow functionalities can be used to complement this change with other options, like assigning that particular User Group exclusive permissions to transition status at that stage, however it doesn't automatically change an item's state. The Review Center Workflow does allow to change status automatically. To read more about these Workflows' differences, we have an article that combines Review Center and Organization Workflow setup information. In order to keep track of the status changes to manually give permissions back to User Groups, and turn the items visible, a filter can be created to search for the items' status (e.g. Approved) and be used to monitor the changes and set the permissions. Alternatively, an empty container with Create/Edit and Read permissions can be created for the restricted User Group. As the status of a hidden item is modified to the pre-arranged state (e.g. Approved), the users modifying that item can move the items into that second container where the restricted User Group is able to see it. This allows your privileged users or creators to transition the item from "hidden" to visible.